I received an email from a long-time member asking what could she do for the Henge. Although she does not practice Keltrian Druidism, she loves the Druid way. She enthusiastically supports the Henge while celebrating with a local grove of another tradition. She also has skills in many disciplines; she writes poetry and songs, shares her plant knowledge and lore with others, and gives psychic readings. Her degree in pastoral studies aids her in her daily work as do the Gods and Goddesses. She also mentioned that she knits. I went on-line and looked once again at examples of her knitting - impressive, beautiful work. Clearly, she is a very talented person and has much to share. In Keltrian Druidism, we think of the Bard, Seer, and Druid as paths or areas of service rather than levels of accomplishment. That is to say, Keltrian Druids of all levels of accomplishment act as Bards, Seers, and Druids. Anything you do that honors the Ancestors, reveres the Spirits of Nature, or celebrates the Gods and Goddesses is a service to them. For example, we celebrate Boann at the Feast of Flowing and at the Feast of Flowering. Boann represents the woman cycle of life during which an individual takes care of self. We always need to be cared for like the Maiden, take care of others as a Mother, and take care of our community, which is the responsibility of the Crone. These are the four stages of care in our lives. Throughout all of our lives, we have times where we take care of ourselves; however, the other three phases of life are never excluded as we do so. In other words, the characteristics of all of the Gods and Goddesses are within you. They ebb and flow in their influence in your daily life. Similarly, you do things that fit the path of the Bard, the Seer, and the Druid every day. The key to being a Keltrian Druid is service to the triad. Keltrian Druids, first and foremost, consciously honor the Ancestors, revere the Nature Spirits, and celebrate the Gods and Goddesses of the Irish Celtic pantheon. I encourage members to share their knowledge, skills, and abilities with the other members. Members can share through writing, song, photographs, workshops, pretty much any medium that will print. Knitting as type of knot magic and is quite ancient. Concentrating on the pouch’s use or the intended recipient while working on it creates an object of both beauty and power. Such a work is easily service to the Ancestors, Nature Spirits, and Gods as well as to the Henge. McFarland Publishing announced the release this fall/winter of Sharon Paice MacLeod’s new book, The Divine Feminine in Ancient Europe. 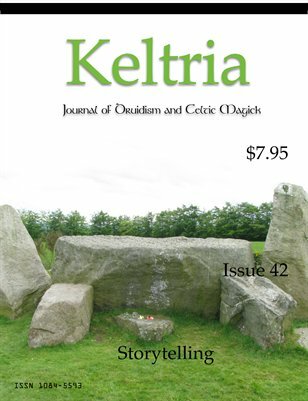 Sharon is a Henge member and Keltria Journal author. 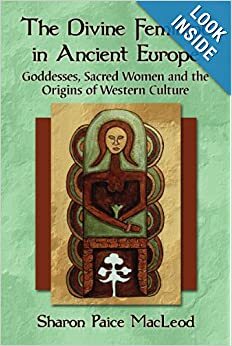 This book is an exploration of the spiritual traditions of ancient Europe, focusing on the numinous presence of the divine feminine in Russia, Central Europe, France, Britain, Ireland and the northern regions. Drawing upon research in archaeology, history, sociology, anthropology and the study of religions to connect the reader with the myths and symbols of the European traditions, the book shows how the power of European goddesses and holy women evolved through the ages, adapting to climate change and social upheaval, but always reflecting the importance of living in an harmonious relationship with the environment and the spirit world. From the cave painting of southern France to ancient Irish tombs, from shamanic rituals to Arthurian legends, the divine feminine plays an essential role in under- standing where we have come from and where we are going. Comparative examples from other native cultures, and quotes from spiritual leaders around the world, set European religions in context with other indigenous cultures. I am definitely looking forward to reading it. To order, see McFarland Publishing’s web site, http://www.mcfarlandpub.com or Amazon.Com to purchase. Employing MailChimp as our Henge Membership Database and Media Campaign management system is a success. We continue to document and refine our processes ensuring consistency and solid follow-up on all membership related tasks. The Gathering of the Keltrian Tribe and Annual Meeting was a wonderful event! Much gratitude to Stewart of the Woods and Firefly for all the imagination and work they put into making this gathering in Colorado Rockies a reality. Please let us hear from you! The beauty of our spirituality lies in our amazing diversity of talents. Don’t hesitate to offer stories, ideas, music, rituals and research to share. We all grow and are enriched by everyone’s unique expression of Life. Niarbyl - Thatched cottage by Irish Sea Photo by Joseph Mischyshyn via Wikimedia Commons Creative Commons Attribution-Share Alike 2.0 Generic license. At the beginning of [amazon_link id="0500270392" target="_blank" ]Celtic Heritage[/amazon_link], the historians Alwyn Rees and Brinley Rees take us into the southwestern Kerry cottage of a traditional Irish storyteller. They describe him as he relates a series of heroic tales, anecdotes, proverbs, rhymes and riddles. He is a “literary artist,” one who has memorized hundreds and hundreds of tales and yet cannot read or write English. His words draw neighbors and friends who visit continuously, sometimes in groups. They sit by the man’s hearth, listen attentively and never interrupt a story in progress. A hundred years later, in South Africa’s infamous Robben Island prison, a group of apartheid-era prisoners fights for the right to read, write and study. Among them is Nelson Mandela, who will spend twenty-seven years of his life behind bars. His comrade, Sonny Venkatrathnam, is eventually granted the right to one book. After talking it over with his fellows, he chooses the complete works of William Shakespeare, a volume whose tales reverberate with markedly similar political struggles. The poetic words depict the anguish of injustice and untimely death, but also resonate with transcendent themes of human endeavor and triumph. Throughout the bitter years of imprisonment, Shakespeare’s stories, which were composed centuries earlier and in a very different milieu, provide inspiration, intellectual stimulation and hope. We live in a society that is disconnected from its stories. We inhabit a world severed from the richness of its cultural heritage. Fairy and folktales, myths and sagas that were once taught in schools and formed part of our cultural currency have been forgotten. While many of the earliest scholars who retrieved, preserved and disseminated these stories, especially the English, dismissed them as superstitious and primitive, some modern critiques have been equally harsh. Myths and fairy tales are reduced to stereotypes or, even worse, are too offensive to teach at all. Millions of Americans are descendants of the six surviving Celtic cultures, yet how many are familiar with the legacy of epic tales, the songs, poetry and wisdom texts that permeated the culture of their forebears? How many realize the marvelous Celtic antecedents of the Arthurian myths, which are arguably the seminal myths of Western Europe, and continue to be retold and reinvented in ever more fascinating ways? Wren and I have been busy with our many projects. Certainly the 2013 Gathering of the Keltrian Tribe and Annual Meeting of the Henge of Keltria was at the top of our list. Every gather is great, but this year was among the best. I hope we will have the gathering hosted there again sometime. I enjoyed the field trip to the Rocky Mountain National Park, as well as workshops by Topaz Owl, Eibhlean Owl, and Steward of the Wood. It was really nice to meet our OBOD guests and a newer member from California who drove over 1000 miles to the gathering. She easily earned bragging rights for driving the longest distance to attend. There were many opportunities to connect with the nature spirits. Marmots, pikas, elk, magpies, and humming birds visited us throughout the field trip. The big project Wren, Karl, and I are working on is the new Book of Keltria, which is our correspondence course in book form. There are new theology and ritual chapters replacing the previous versions of the correspondence course material. Also the Gods chapter has undergone substantial rewrite. A big change in the theology chapter is that the “beliefs” have been replaced with “hallmarks” of Keltrian Druidism. The fundamental difference between the beliefs and the hallmarks is that within Keltrian Druidism, what you believe is not as important as what you do. Hallmarks are based upon actions rather than words. Another big project underway is a substantial rewrite of the Book of Ritual. There are many things that were not covered adequately in previous versions of the Book of Ritual. I hope to get this information incorporated and a new edition released soon after the Book of Keltria. This expanded edition will provide details on the how, what, and why of Keltrian ritual. Ireland has an international reputation as a nation of writers and storytellers, and it forms a large part of our national identity. Is this an empty statement of patriotic pride, an outmoded stereotype or a deeply engrained thread of Irish culture and consciousness? We, the Story Archaeologists, would argue for the last of these options. However, many tales and poems, from both literary (written) and oral sources, have strong dindshenchas elements to them. To identify a dindshenchas episode, one need only see whether it answers the questions which St. Patrick repeatedly asks of Oisín and Cailte in the Acallamh na Senórach, “The Colloquy of the Ancients”:4 What is this place called; how did it get that name? It seems clear that these stories have their origin in a pre-literate oral tradition, although that is, by necessity, unprovable. We can only build a case for their oral origins through analogy with other cultures. They have particular resonance with the indigenous Australian stories of the Dream Time, which tell of the shaping of the land and the landscape’s meaning to those who inhabit it. Some of these stories are demonstrably ancient, with one story from the Queensland area describing a lake which, it has recently been discovered, dried up about 35,000 years ago.5 Unfortunately, we have not yet found such an unequivocally ancient story from Ireland, but we can postulate and listen to the stories themselves. What we do have is a written tradition dating back to the 7th century, with later manuscripts containing sagas, poems and legal texts whose language places their literary origin as early as the 8th century.6 Many sagas placed in the mythological cycle, such as Cath Maige Tuired, “The Battle of Moytura”,7 and the Ulster Cycle, such as Táin Bó Cuailgne, “The Cattle Raid of Cooley”8, have many passages in Old Irish (7th - 9th centuries CE). This includes one of the rémscéla, “pre-stories,” to the Táin Echtrae Nerai, “The Adventures of Nera,”9 which we discuss below. In the elementary school classroom, the teacher pushed primary-color tacks onto the map of the world, one for each of our ancestors. Specks of plastic dotted the usual places: Italy, Ireland, sometimes Africa. Our assignment, she said: Find out where your family is from for a book report and, of course, the ceremony that was thumbtacks-on-the-map. On the way home, my next door neighbor glowed and crowed of her European mutt heritage: English and Danish and French, and whatever else she remembered to say that day. She chanted the names of her line and recounted her family's history as I kicked leaves on the sidewalk. The neighborhood used to be her family's farm, even though it had since been reduced to one green and white farmhouse in disrepair. Thank-you to all who make purchases through Amazon.com using the Henge as a referral. Your support is greatly appreciated. For those who don’t know about the Amazon Affiliate program, the Henge earns up to 4% on your purchases. There is no additional cost to you and you can buy anything sold on Amazon. It is easy and it benefits the Henge. To use the program, go to the Henge of Keltria Recommended Reading page. Add this webpage to your favorites and use it regularly. Once there, just click on the “Powered by Amazon.com” logo on the upper left and away you go. Alternately, go directly to Amazon using our tag and add that address to your favorites or bookmarks. Either way, you access Amazon quickly, easily and support the Henge of Keltria and Keltrian Druidism. or you may contact Chaplain Bradley directly for more information at via email at bradley.james@mail.dc.state.fl.us or via telephone: (850) 973-5506. For the members version of this posting please see the Members Page. 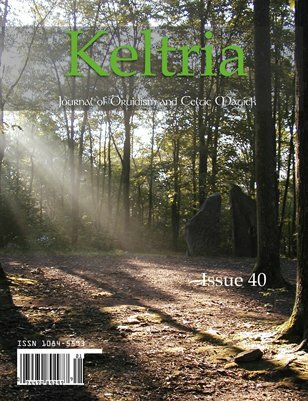 Print copies of Keltria Journal Issue #42 are available via MagCloud.